Accuweigh has recently released a range of relocatable steel deck weighbridges, which are assembled using modular sections to allow weighbridges to be constructed in varying lengths using common components. Accuweigh’s relocatable weighbridges consist of two main structural assemblies: the steel deck sections and the centre block assemblies. Adjacent deck sections are connected using the centre block assemblies, which also function as the weighbridge end sections. For significantly increased structural rigidity, the centre block assemblies contain the weighbridge load cells and mounting hardware to function as the main load bearing points of the weighbridge. This unique design ensures a very strong and robust weighbridge deck that eliminates deflection under heavy loads while also offering a very low profile to minimise access ramp costs. Accuweigh’s steel deck weighbridges are assembled on site requiring the use of a light crane to assist with section placements. The weighbridge can usually be constructed in a single working day with the load cell mounting hardware firmly attached to the concrete foundations using structural bolts and fast curing epoxy grout. Weighbridge testing, calibration and certification can then be performed the following day with the weighbridge immediately being made available for trade weighing purposes. Accuweigh’s relocatable steel weighbridges are available in a variety of deck lengths and configurations including single deck weighbridges, dual deck weighbridges and even multi-deck weighbridges. 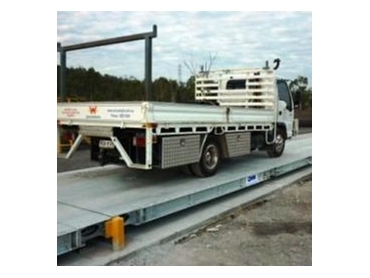 Accuweigh sells, installs and commissions more weighbridges in Australia than any other company and has two dedicated weighbridge manufacturing facilities to cater for all industry needs in weighbridges.